If you want to protect your parental decision making rights, sign this petition. Please include the state you live in when you leave a comment. This will let us know which area of the United States are being reached. Editor’s note. The following testimony will be delivered this afternoon of support of HB 1915, Simon’s Law. It has two basic components. First, a health care facility must let a patient, resident or a prospective patient or resident know if they have a futility policy that will limit care in any way. Second, a do-not-resuscitate order cannot be placed in a minor child’s medical file without the written permission of at least one parent or legal guardian. Hello, my name is Sheryl Crosier, but more importantly, I’m Simon’s Mom. There are no words that I can use to describe the pain and continued suffering that my family and I have endured after realizing the reality of what happened to our son, Simon. Can you begin to even imagine having life or death medical choices made by a total stranger other than your loved one? Today, I would like to share Simon’s story and [discuss] protecting our parental decision making rights. I am going to share with you how my rights were violated, at the cost of my son. And if you don’t think it can happen to you, think again, it can and may cost you the life of your child. You see, my son, Simon was the price we paid for the violation and removal of my parental rights. On September 7, 2010, God blessed us with a beautiful baby boy named Simon. His name means, “To be heard.” Even with a bilateral cleft lip, he was absolutely perfect to our family. 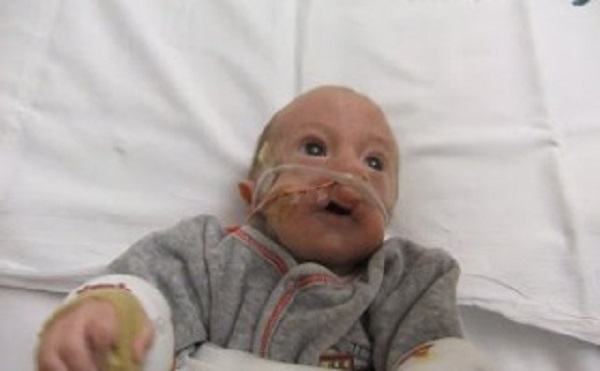 On Simon’s 3rd day of life, he was officially diagnosed with “Full Trisomy 18,” also known as Edward’s syndrome. His care and treatment changed dramatically after the diagnosis. We wanted Simon to have every opportunity to thrive and survive. However, some medical professionals thought differently. One doctor even turned off Simon’s monitor while I was down the hall having lunch with another NICU mom. As we were walking back to our babies’ rooms, we noticed Simon’s monitor was off. I screamed, thinking my son was dead. One of the nurses in the hall told me which doctor did this. I confronted him and said I never gave you permission to turn off my son’s monitor. I was livid! And I let him know what he did was wrong! When Simon’s oxygen saturation levels began to fall, we were told this is the end-nothing could be done. Simon drew his last breaths, I asked again what could be done and was told “nothing.” At 10:45am on December 3, 2010, Simon died. Here we are in this hospital environment panicking and scared. Our hearts were racing and it was extremely painful to see our son so helpless. We were looking to the experts to help our child and what I got, I didn’t expect. I then looked at my husband. He was in the same situation, who was going to help our son? I wasn’t even aware of my own breathing. The sole focus of our attention was just Simon. We were losing Simon and where was our help? Where were those experts that we paid to save our son? No carts, no beeping monitors, no means taken, absolutely nothing was done. We are standing alone. Where were the hearts for our son? I know Simon had some very special nurses, but later they told me their hands were tied and the doctors already had their minds made up about Simon. If somebody in this audience was struggling to breathe, how many of you would do absolutely nothing? Imagine watching your child take their last breaths, his oxygen saturation levels plummet and the medical professionals did nothing. Only after Simon’s death did we find out the truth. There was a DNR-Do Not Resuscitate in his chart; that we did not know about, consent to or even discuss with medical personnel. Now that explains why they did nothing. On top of that, later we found out Simon was only getting comfort feeds. Do you know the definition of comfort feeds? This means the least amount of food. This food was not intended for nourishment. It means they starve you to death. If Simon wouldn’t have stopped breathing, he would have been starved to death. In addition, Simon was given Adivan, also known as lorazepam twice before he died. Later, one of Simon’s nurses told me that this medication was contraindicated in patients with apnea. Simon had apnea. We also learned from a pharmacist friend, that he would not give this drug to an adult having apnea, much less an infant! This drug is also known to suppress breathing. Simon’s oxygen levels were declining. You see, it was battle we fought to defend our son’s life and dignity. Not only were Simon’s rights violated, but also our parental rights were taken away. When our son, Simon was a living, breathing human being, who brought incredible joy to his family; and he experienced love and joy from us…did he NOT deserve the right to live? Someone else decided our son’s life didn’t have value. Care was withheld and a DNR order was placed in our son’s chart, without our knowledge or consent as Simon’s parents. Ultimately, our wishes were ignored and most likely, Simon’s death was expedited. I can’t bring my son back. But, I want to make sure this doesn’t happen to another child, your child and my other children. In my opinion, no one loves their child more than their parent. Simon’s Law will protect the rights of parents concerning any surviving medical choices for their minor children. So if your six year old son falls off his bicycle and ends up with critical injuries. Or your thirteen year old crashes their hoverboard and sustains serious injuries. Or your sixteen year old is involved in a car accident and suffers life threatening injuries. Don’t you want to be fully engaged in the decision making for your child’s care or do you want to leave the decision making in the hands of a medical professional that you most likely have just met for the first time? I am asking you to please support Simon’s Law. After all, shouldn’t every child have the opportunity to thrive and survive? The Senate passed both bills provisionally Monday with a final vote tally for both scheduled for Tuesday.UPDATE, Tues. 11 am: Final tally: SB 437,Simon’ s Law, passed 36-4 and SB 436 passed 31-9. To explain why no entity opposed Simon’s Law, Sen. Kelly made a false claim that “the process for it was too rushed,” with only one day’s notice given for the March 3rd –thus prohibiting all stakeholders from testifying. That was both absurd and provably false! LifeNews.com Note: Kathy Ostrowski is the legislative director for Kansans for Life, the state affiliate to the National Right to Life Committee.